Cop on Top® events can be held at any popular retail or grocery store in your community. Law enforcement officers and volunteers are stationed at store entrances and collect donations from store patrons. Volunteers that assist law enforcement officers may be civic organizations, schools, family and friends. Date: Friday, September 7, 2018. Locations: Click here for a full list of locations. Throughout the year, local Law enforcement pair up with Walmart’s across the state of Iowa and collect donations. 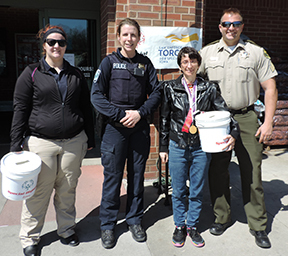 Stop by and support Law Enforcement Torch Run and Special Olympics by donating! Check back for updated 2018 dates.